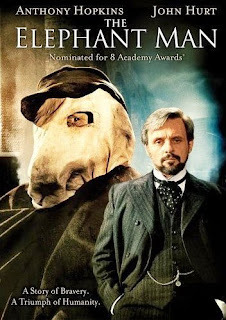 The Elephant Man stars John Hurt as John Merrick (the Elephant Man), and Anthony Hopkins as Frederick Treves (the physician who eventually becomes sympathetic with Merrick's situation). I learned after watching this movie that John Merrick's first name was actually Joseph. Merrick's condition brings to light the best and worst of the people he runs into, from vindictive predators to those who go out of their way to comfort and care for him. For most of his life a greedy circus boss uses him as a lucrative sideshow. This man, as well as those who pay him to gawk, see Merrick not as a human being, but as a spectacle that exists for their entertainment. Frederick Treves' first impression of Merrick is as Elephant Man, the star of a circus show. Merrick's identity is already established as a public spectacle, so Treves doesn't think twice about subjecting the man to further humiliation, though this time in front of a more scientific audience. But, as Treves continues to investigate Merrick's physical ailments, he can't help looking on his subject with increasing compassion. Eventually Treves becomes Merrick's main advocate. He introduces this former recluse to public life, giving him the chance to win the respect of London's high society. However, even as Merrick gains the respect of some, other predators emerge and expose him to additional public mockery for their entertainment as well as to make a quick buck. The Elephant Man juxtaposes unbridled cruelty and genuine compassion. This movie reminds me of the fact that the world has a desperate need for morally solid men. Men needn't acquire exceptional strength or intelligence to defend the defenseless; they only need to listen to their consciences. Frederick Treves, for example, isn't outwardly religious or spiritually-inclined, yet he resists the men who try to exploit Merrick's condition. The Elephant Man also illustrates our inherent inability to see people as they really are. At first glance, people are repulsed by Merrick's appearance. But, when people give the chance, he wins them over with his quality of character. There also implications here for all of us from a spiritual perspective, though the roles are reversed. Christ can see who (or what) we really are spiritually--twisted, ugly creatures infected with putrefaction and death--but He chooses to look on us with love and compassion, even to the point of healing and restoring us. Unlike Merrick, getting to know any of us who are distant from God would not lead others to admire us more... though we have learned to art of putting on a good show, we are naturally despicable in the way that counts--in our souls. But Christ goes out of his way to seek us out, give us comfort and eventually save us from ourselves. He is courageous and self-sacrificing for us to offset our fear and pettiness so that we might learn from His example and do likewise. I'd forgotten about this film and this story even, but it is good to remember. There is definitely a powerful message here as you point out not only about the need to look beyond initial perceptions, but also to be strong in your convictions and to strive to do what is right in spite of societal opposition or simple peer pressures. I'm sure many people know an Elephant Man in our own lives...somebody who exists on the outskirts of social norms for one reason or another. We should strive to be kind and inclusive to those around us and to look at people with an eternal perspective and view everyone with the same compassion that we hope to be viewed by others. Excellent post. Thanks for reminding me of this film. Legit! Sweet stuff man. How awesome is God that He would do whatever it takes to pursue us. I imagine a rebellious kid playing in traffic despite his dad's insistence that it would be way more fun to play ball with him in the front yard. Interesting. Have you discussed Groundhog Day on your site? That film always seems to raise fascinating issues for Christians it seems to me.